India is now officially a bigger smartphone market than the USA, and while the US is close to stagnation, with few people left who haven’t connected, India is barely out of first gear. Not for nothing do I constantly say India is the most exciting prospect on the planet for future digital engagement by the publishing industry. Samsung and Xiaomi lead the way, with Xiaomi expected to surpass Samsung next year. With the explosion of LTE in India the number of smartphone users in the country is expected to hit 300 million by the end of this year, and reach 442 million by 2022. Globally there are expected to be 2.3 billion smartphones in use by 2022. Every device by definition one that can be used to receive – and pay for – digital content from publishers. As we wind down this decade publishers have unparalleled potential reach and unprecedented opportunities to access the global markets on a scale quite unimaginable even five years ago. As yet the publishing industry retail and distribution infrastructure has still to catch up – video streaming is far more advanced, with Amazon Video and Netflix both available in over two hundred countries and territories – but that will come soon enough. However, don’t bet on the usual suspects – Amazon, Apple and co. – being the ones that lead the way. Apple’s commitment to iBooks is in doubt. And behind the gloss and fanfare about the just-announced big revenue jump for Amazon lies a $936 million loss on its international endeavours. This following a $724 loss last quarter, a $481 loss in the quarter before that, and a $487 loss before that. The new smartphone-driven opportunities unfolding in the international markets are likely to be exploited first by other players. China’s Tencent, for example, which is already active in Thailand and now working with Wattpad. Or forward-thinking smaller players focussed not so much on where the money is now but where the money will be down the road. As reported last week, the global book market is estimated to be worth $143 billion, and only 29% of that is in the USA. That’s a good starting point to work from. Now spare a thought as to what the global video-on-demand market was worth five years ago when only handful of markets were involved, what is is likely to be worth now, and its potential worth ten year’s down the road as smartphone penetration and internet take-up continues. There’s little room left in the USA for smartphone growth or internet growth. 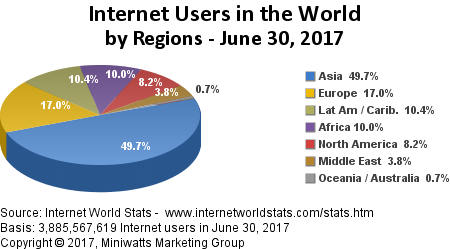 Yet the entire North American continent – the USA, Canada and Mexico – accounts for just 8.2% of the world’s internet users. India alone is expected to have 829 million people connected to the internet by 2021 – and that will still only take India to 60% penetration. As publishing embraces the new opportunities digital offers to reach Indian consumers in all languages and wherever they may be, India is unquestionable the most exciting prospect on the planet for publishers and authors.